Designer Pam Meyer has been producing her limited production collection of jewelry and gift items, sold in galleries and museum stores nationwide, under the name of ALCHEMY, since 1984. 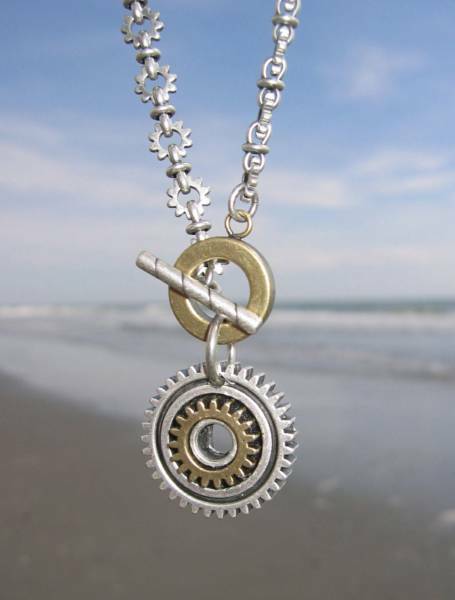 Pieces are created with castings taken from industrial artifacts of the machine age, incorporating items such as gears, levers, antique keys, 45rpm record inserts, and other found objects. She draws her inspiration from the urban environment, the remnants of the machine age, and monumental forms that convey a feeling of strength and simplicity. ALCHEMY is uncompromisingly modern, profoundly sculptural, and intentionally trans-seasonal, always striving for originality within the confines of practicality, meshing a passion for the artisanal with a penchant for the affordable. All ALCHEMY merchandise is comprised of pewter castings made from reclaimed metals, brass based chains and findings plated with finishes in antique silver, antique brass, and antique copper. Earring posts and wires are surgical steel. ALCHEMY products are built in Brooklyn, by or under the direct supervision of the designer.